Proclaimed a super-food and offering many health benefits, chaga mushroom extract is becoming more popular today, even though it has been used widely for centuries. The chaga mushroom can be found growing on birch trees, although it does grow on other trees such as elm and ironwood. Its appearance is like a black growth that may be mistaken as rotted tree by the unknowing eye. Peeling off the birch skin around the chaga is important because the chagra grows underneath the bark and the complete mushroom may not have erupted through the bark and be visible. Once it is completely uncovered it is removed from the tree with a chisel, knife, or even a rock depending on how secure it is against the tree. It comes off in one big mass, and a large enough mushroom (about the size of your forearm) can last a person well over a year. The size of a chaga mushroom varies widely and has been seen up to three feet long. Once the mushroom is removed, the outer black part is removed, it is cut into chunks and then it is dried out. Then the inside of the mushroom is ground into a powder and preserved. Storing it in a brown container will increase its shelf life; although, it does last a very long time once dried. Extraction has been said to be necessary to receive the full benefit of the mushroom, as well as to digest all the active ingredients properly. There are three ways of extraction. 1. How Water Extraction - This is the cheapest way to extract it which means it's also the most popular. 2. Extraction using alcohol or ethanol - This helps to isolate the components that are not water soluble. 3. Fermentation - This is the most expensive way and it is not standardized, which means that many different types of bacteria and fungi can be used and the results may vary. 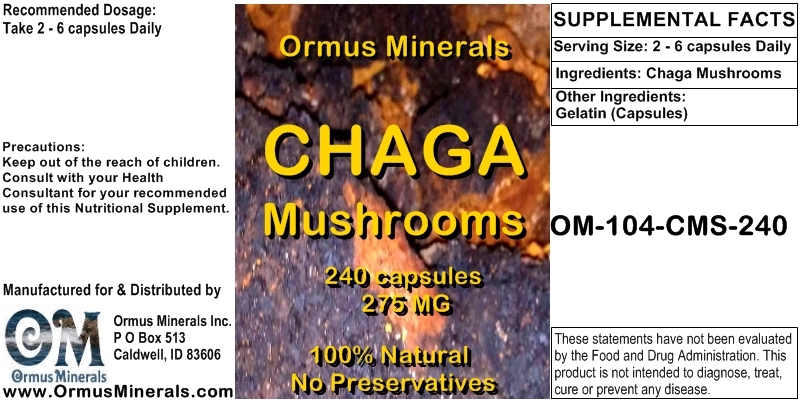 The chaga mushroom extract has many powerful and beneficial qualities. This has long been a known fact as there have been reports of it being used since the 16th century as a remedy for many things including cancer, ulcers, and gastritis. Referred to as the king of medicinal mushrooms and containing polyschharides, betulinic acid, triterpenes, germanium, and a whole host of other minerals and nutrients, it has been noted as a super-food that is beneficial for just about anything. Just a few of the benefits are:Wards off allergies.Helps with asthma.Increases energy.Helps ease arthritis.Good for Colitis.Promotes good liver health.Helps balance immune system. There are many different ways you can use the extract. You can add it to almost anything including:Tea, Coffee, Juice, Soup, or Stew. Essentially, you can add it to just about anything you eat or drink. It's important to remember to add it after the cooking or boiling process, as adding it during the process can damage the beneficial properties that it has. A few important things to remember when considering taking the chaga extract are that: Chaga is incompatible with antibiotics. Allergies are possible.If you are on aspirin or warfarin then the mushroom can magnify the effects resulting in bleeding.Should not be used with diabetes medications such as insulin. In the end, whether you want to have more energy, heal an ailment, or just improve your overall health - chaga mushroom extract can help.